Levi Wilson is no stranger to severe weather. He lives in Oklahoma, right there in “Tornado Alley” that stretches from South Dakota to Central Texas, where the cold air from the Arctic meets the warm, humid air from the Gulf of Mexico, setting off deadly supercell thunderstorms and tornadoes. So, naturally, when Levi bought a home that didn’t have a storm shelter, his first project was to build one. But which type? There are bank vault-like shelters that are constructed when the home is. So that was out. There are bank vault types that can be brought into an existing home, but they take up too much space that is needed for living. Underground shelters are the most popular, but you have to leave the house to get to it and climb down stairs—not easy for the elderly or disabled, impossible for wheelchair users. Besides, those shelters get musty and are unpleasant to stay in for any length of time. A basement might be an option somewhere else, but homes in Oklahoma typically don’t have basements because of the rocky soil and high water table. There was Levi with an engineering degree from the University of Oklahoma, his machine shop and his experience in and talent for designing aircraft parts. He thought, “Why not me?” Why couldn’t he figure out how to build a better storm shelter? He determined that he could, and he started drawing. Serendipitously, he ran into Tim Todd, owner of the largest welding facility in the US and owner of a successful sales and marketing firm. Levi shared his ideas with Tim; Tim was on board right away. The partners came up with a way to convert any regular-sized bed into an above-ground shelter that provides protection from severe weather, home invasions, terrorist attacks or any other fearful situation. They called it the Vortex Vault Storm Shelter Bed. The ingenious technology takes advantage of all that wasted space under the bed. Push a button on a remote control, and the storm shelter rises to 57” high in a minute or so, allowing three to seven people (depending on the bed size) to walk right into it or roll right into it for wheelchair users—scamper right into it for Fido or Tabby. Power out? There’s a battery backup. Battery out? There’s a manual crank if worse comes to worst. It’s also outfitted with battery-powered lights and a USB charging plug so you can use your electronics to get information. 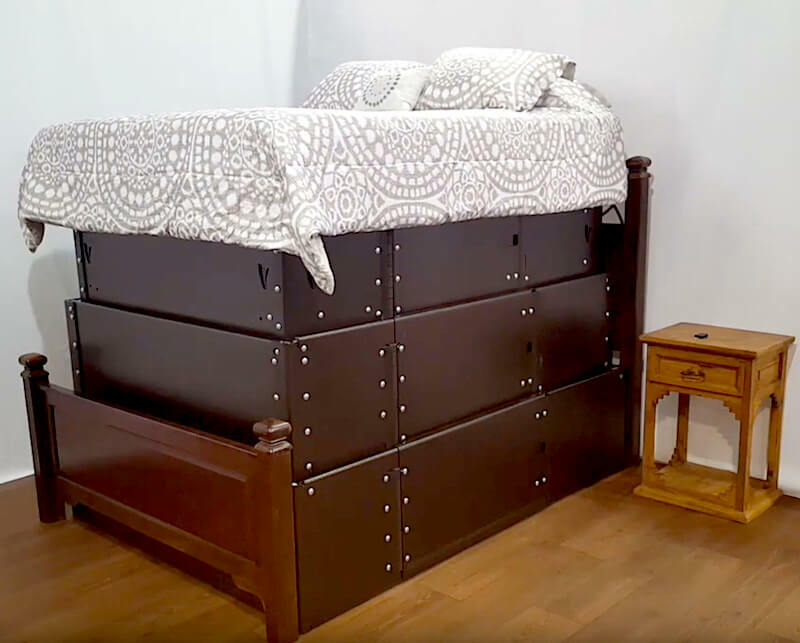 When the shelter is in the down position, there is about 19” of space that you can access by crawling under your bed in case of a home invasion. (You might be glad to know it’s bullet proof.) It’s also a very safe place to keep anything of value, such as documents, money and jewelry. Levi and Tim had the shelter tested at Texas Tech University’s National Wind Institute, a state-of-the-art facility with tests based on FEMA standards. The Vortex Vault was subjected to F5 (more than 200 mph) winds, debris fired by giant air cannons at tornado speeds, and cars dropped right down on it for a 60,000 pound crush value. It passed all the tests the first time; few shelters do. It also meets all ADA standards. Levi and Tim are not done. They are now working on a telescopic shelter under a pool table, kitchen island or the work bench in the garage!